User provided content and videos from around the world ! Or LCD - it's up to you ! Discussion forum on RCgroups is here. 3 Where do I start ? With 1W or power, the Ultimate LRS provides full telemetry and RC control up to 40 km. Check the user provided content page to see many flight videos. Notice that 40 km is not the limit of the system, but the further a user has flown with it, limited by his plane’s battery range. The system is capable to go to 100 km with good antennas and a sufficient altitude to keep a direct line of sight (earth’s curvature). Distance of 40km with vee antenna on plane, and 4 elements yagi on ground station : click here for detailed setup. Check here the current distance records obtained by users with ULRS. 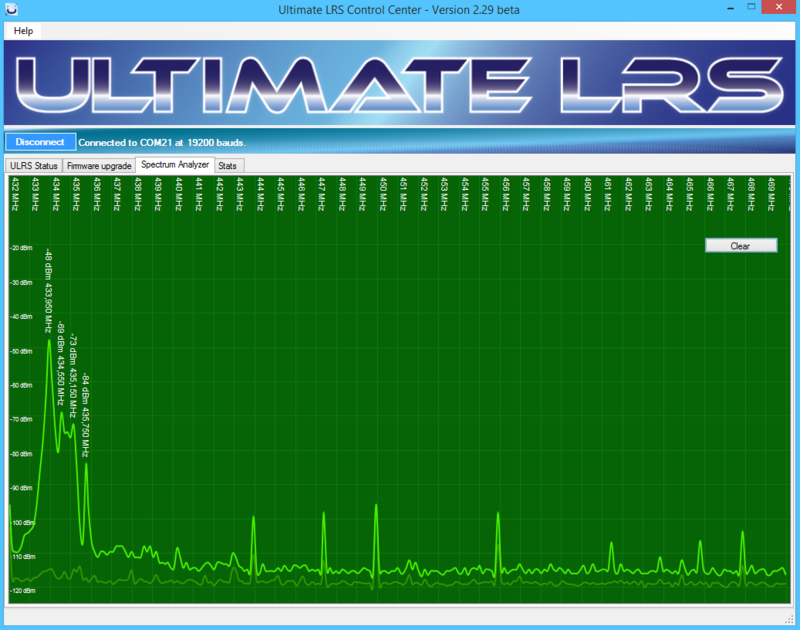 The speed of Ultimate LRS allows to make all mavlink operations in the air. For example connecting, modifying parameters in flight, uploading new waypoints, or any other mavlink command. It not only support the default Mission Planner telemetry speed, but can handle much more such as 10 refresh per second for the attitude and position, giving completely smooth artificial horizon movements. A more detailed features comparison with 3DR radios is provided here. 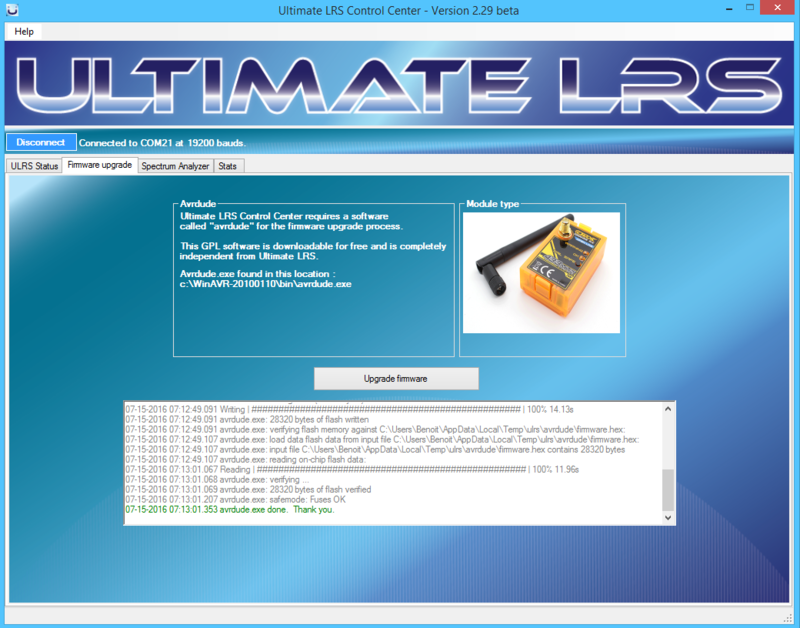 The Ultimate LRS is based on two Hobbyking OrangeRX 1W TX modules (or a 1W module + a 100mW module). These 1W modules are available for $26.94 each, a total of $53.88 for a complete system, notice that the firmware is completely free. The project provides a complete documentation on this site, including clear installation instructions, links to user videos and content, complete spectrum analysis, proposed mods etc. A very active user community has grown in this rcgroups forum. Feel free to join the community and propose your ideas and suggestions, or get answers to your questions. Users have made new 3D printed cases, new antennas designs and videos,click here to see some user provided videos and other ULRS related creations. The Ultimate LRS is complex inside and simple outside : no technical settings to guess, it’s just plug and play. 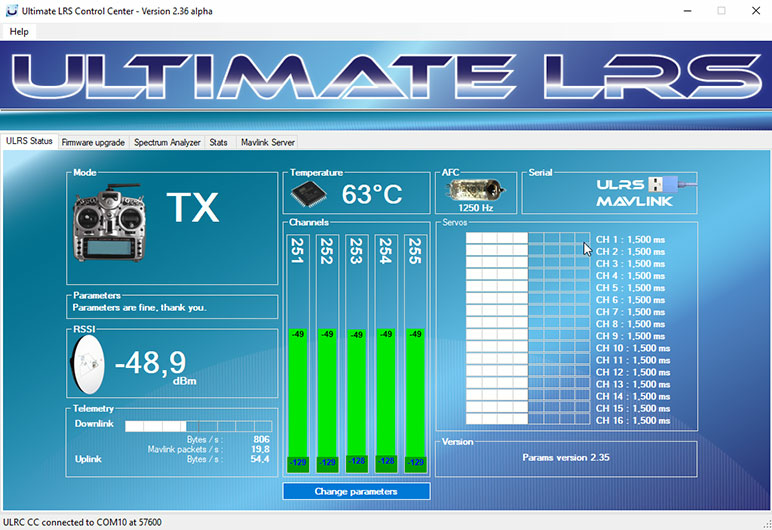 The ULRS CC is a software running on Windows, which will allow to burn / upgrade the firmware, check the live status, select channels, modify parameters etc. It’s a single-page overview of the system health. It’s possible to simultaneously display this page, Mission Planner andr another ground control software. The status page shows also the firmware version, failsafe status, and can detect other issues such as uninitialized parameters. 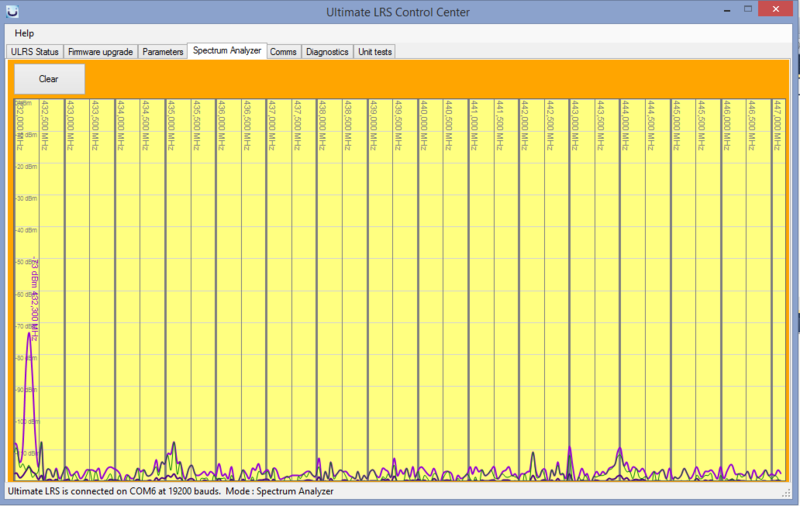 The Status page shows the available COM ports, and will detect automatically ULRS modules connected, if they are RX or TX, and their baudrate (TX = 57600, RX = 19200). Select the correct serial port and click on connect. It’s on the screenshot above, the “Channels” box : this view shows the currently selected channels, and interesting data about them. The light green bar represents the signal strength for a given channel, and the dark green bar is the noise level for the channels. What’s important is to have a low noise level, and a high signal level. The difference between the two is called the SNR (signal to noise ratio). Currently no other LRS system provide this information, especially not in real time and per channel. The numerical values are expressed in dBm. To understand why this is useful, think about a sound signal : someone talks to you and there’s almost no background noise, so you hear him or her very well. Then he/she walks progressively farther, while keeping the same voice volume. You hear less and less and at a certain distance you only understand some words. When a car passes near you, you don’t understand anything because it’s too noisy, except if the speaker is really close to you. So what’s important is not the speaker’s perceived volume, but the volume in comparison to the background noise. It’s the same for the ULRS. Rather than just measuring the perceived volume (Signal Strength), we will also measure the background noise. The difference between the perceived volume and the background noise is the only interesting data, namely the signal-to-noise ratio or SNR. And in Decibels, it’s really simple, it’s the difference between the noise level measured in dBm, and the signal level measured in dBm. You know understand the different columns. In the screenshot above, we can see the signal level is between -68 dBm and -66 dBm for all channels. So we could think that all channels are good. But if we look at the SNR, the first and third channels have a lower SNR (= are less prone to errors). So it could be a good idea to replace them by other channels. If we want to understand the cause, we have a look at the Noise column, and we see they both have a high noise level (-98 dBm and -101 dBm are greater noise than for example -113 dBm). So in practice, just look at the Channels, the values should be high and about the same for all channels. As the distance will grow, the value will lower, and at the limit we will see the quality degrade, as progressively more packets will be lost. Your exact limit value is to be determined experimentally, as some users fly a lot in autopilot and are not afraid of loosing some packets, while others prefer to fly manually and require a large security margin. You’ll see it’s really very useful. In a future release it will be possible to monitor this while at the same time having Mission Planner running. And in a more future release, to change the channels while in flight. And of course in future future release, the channels will be dynamically allocated during the flight. The last thing to know about this, is that the SNR value has a physical meaning : every time you double the distance, the SNR value will be diminished by 6 dB. And it’s quite precise. In a future release, the current distance will be calculated automatically (from mavlink data), and the maximum reachable distance will be calculated from the SNR. Simple calculation, but high practical value. Well, it’s as simple as can be : After being connected, click on the Upgrade firmware button, and that’s it. And where do you select if it’s a TX or RX ? You don’t need to, because it’s the same firmware for TX and RX : if the firmware detects PPM it will act as a TX, else it will be a RX. This page shows a spectrum analyzer with the average and maximum values for all frequencies. Additional features are coming to select the start and stop frequencies, and be able to show the channels. Click on the ‘Change parameters’ and you’ll get a popup showing the current parameters. The rule is very simple : select the same channels and bindcode on the TX and on the RX. The bindcode can be seen as a simple signature. The TX and RX must have the same bindcode. ULRS will reject any packet that has not the bindcode it’s waiting for. This is important because the number of channels is not infinite, and it’s possible that someone picks one of the same channels you’ve selected. Clicking on apply will save the parameters to the module. The goal of this beta version is to test ULRS on different computers, identify bugs and collect your ideas and suggestions to improve the next release. You can bring any new idea or make comments on this page or by email. Start by checking the material you’ll need.